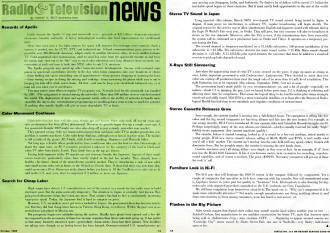 Electronics World magazine for a while had a monthly feature titled "Radio & Television News." It was a roundup of top news bits. This particular month's collection had a lot of notable topics. On the heels of the Apollo 11 moon landing, NASA informs people of the many benefits research and development on necessary technologies that will redound to the commercial and consumer sectors. "Success with on-board computers in spacecraft contributes directly to the day when home computers take over hundreds of chores - from feeding the cat to reminding you of appointments...- and maybe keep your checkbook balanced." PCs and smartphones were still the realm of science fiction and futuristic predictions in Mechanix Illustrated at the time. Medical monitoring, body science, quart crystal timekeeping (think wristwatches), cordless tools, extreme weather survival gear, cosmetics (you read right), computer programming and semiconductor electronics, ballistic parachutes, and much more. My mother-in-law was never convinced that space and planetary programs paid dividends to mankind. 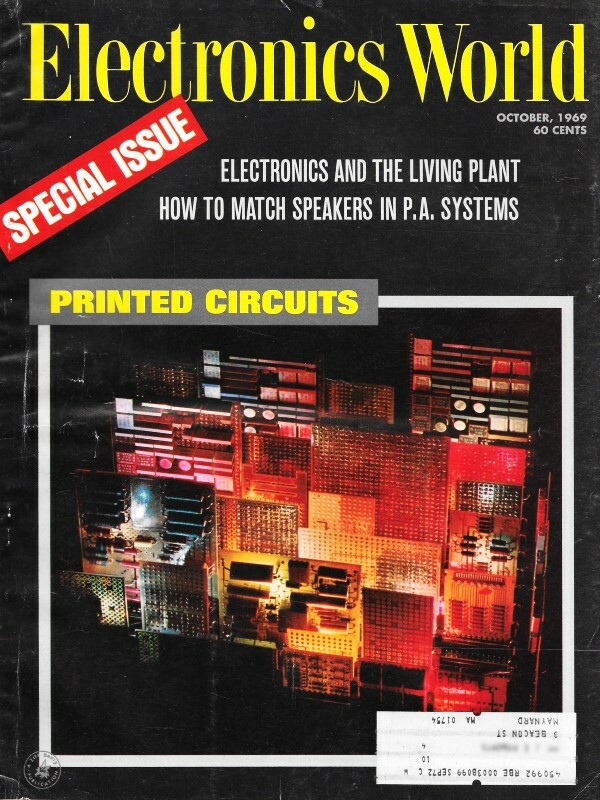 Also reported are advances in color TV adoption, a major shift to offshoring production, the scare of x-ray emission from sitting too close to your TV set (your mother was right), and a shift from analog to digital clock radios. Costly though the Apollo 11 trip and moonwalk were - upwards of $22 billion - home-entertainment electronics benefits indirectly. A heavy technological overflow has bred improvements for earthbound gear. Ideas that went into a low-light camera for space will improve live-coverage news cameras. Such a camera is needed, too, for CCTV, ETV, and industrial use. S-band communications gear, proven so dependable over 240,000-mile distances, adapts easily to satellite television relay, or even satellite-to-home TV. Field-sequential color transmission, used to send live color from the spacecraft en route to and from the moon, may turn out to he "the" way to send color television over long distances here on earth, too; converters at each end turn it back into NTSC color to suit U.S. receivers. The Apollo program may speed up other home-electronic developments. Success with on-board computers in spacecraft contributes directly to the day when home computers take over hundreds of chores - from feeding the cat to reminding you of appointments - from grocery shopping to watering the lawn - from storing recipes to doing the mixing and cooking - from answering the phone while you're out to keeping the kids off it while you're home. All that - and maybe keep your checkbook balanced, too, or at least tell you when you're overdrawn. You may notice some effect on regular TV programs, too. Network feed for the moonwalk was handled by ABC. (The assignment is rotated among the networks.) More than 500 million viewers watched around the world. The deployment of men and equipment surely adds to the ability of networks to handle more smoothly the day-to-day entertainment programming we earthlings have come to take so much for granted. If nothing else, maybe Apollo will give us more dependable TV at home. Color television has done well this year, despite ups and downs. Since color took off several years ago, sales performance has been all but phenomenal. However its growth began slowing a couple years ago. A few pessimists thought 1969 might see color sales drop off to just a steady year-after-year market. They guessed wrong. Only one home-entertainment item outclasses color-TV in market growth this year and that is cassette machines. Color sales keep climbing, although not as fast as in prior years. The market is still a battle of the giants. RCA leads, with Zenith overtaking. Magnavox and Motorola follow. Not long ago, a Zenith officer predicted his firm would soon take over the lead in color. Interestingly, at about the same time, an RCA executive predicted a takeover by his company of the lead in black-and-white TV sales from leader Zenith. Thus battle lines at the top are drawn. Eyeing both segments of the TV market are our overseas friends, the Japanese. Imports of their small-screen receivers, particularly color, have nearly tripled in the last few months. They already have a healthy (for them) chunk of the monochrome portable market. They're introducing a rash of new solid-state small-screen color sets at home, in the 10-inch to 15-inch class. If those find their way over here, they could carve out a 30 or 40 percent niche almost before you know it. Of the 7-million-or-so color sets to be sold in the U.S. next year, don't be surprised if 2 million or more are Japanese. High wages have driven U.S. manufacturers out of the country in a search for less costly ways to build electronic gear. But the gains seem only temporary. The situation in Japan is probably best known. Bargain-priced electronic items don't exist any more. That country has had to face a continuously increasing wage-price spiral. Today, the Japanese find it hard to compete on price. However, U.S. set-makers never got even a toehold in Japan; the government there has been too restrictive. But they did find cheap labor havens in Taiwan, Hong Kong, even Korea. Within the past year or so, several have put plants in Mexico, too. But prosperity begets new attitudes among the natives. Hardly have plants been opened and a few dollars injected into the economies of these low-income countries than labor costs start going up. It has gotten so that many formerly attractive spots - particularly Asian areas - have lost their glamor. New localities are taking over, though. so no lasting lesson has been learned. Overseas-oriented U.S. manufacturers are now moving into Singapore, India, and Indonesia. No doubt a lot of dollars will be saved (?) before the inevitable spiral begins in those countries. But it must surely look opportunistic to the rest of the world. 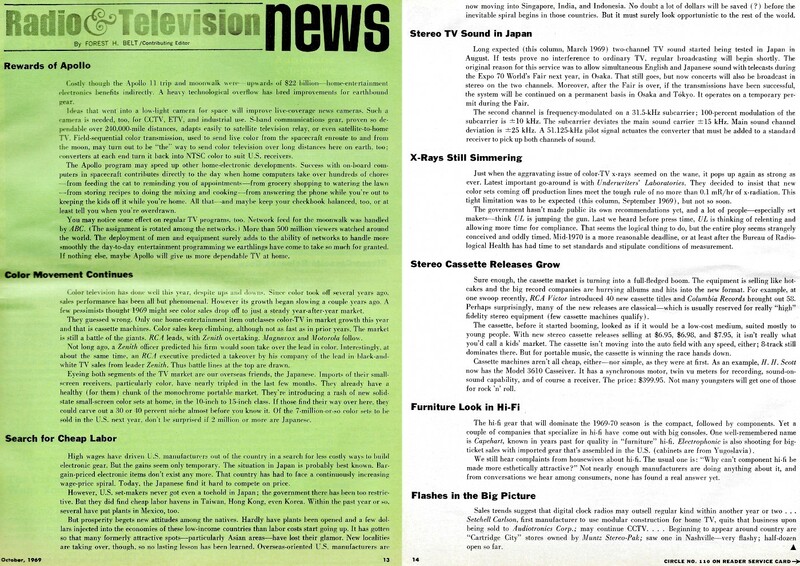 Long expected (this column, March 1969) two-channel TV sound started being tested in Japan in August. If tests prove no interference to ordinary TV, regular broadcasting will begin shortly. The original reason for this service was to allow simultaneous English and Japanese sound with telecasts during the Expo 70 World's Fair next year, in Osaka. That still goes, but now concerts will also be broadcast in stereo on the two channels. Moreover, after the Fair is over, if the transmissions have been successful, the system will be continued on a permanent basis in Osaka and Tokyo. It operates on a temporary permit during the Fair. The second channel is frequency-modulated on a 31.5-kHz subcarrier; 100-percent modulation of the subcarrier is ±10 kHz. The subcarrier deviates the main sound carrier ±15 kHz. Main sound channel deviation is ±25 kHz. A 51.125-kHz pilot signal actuates the converter that must be added to a standard receiver to pick up both channels of sound. Just when the aggravating issue of color-TV x-rays seemed on the wane, it pops up again as strong as ever. Latest important go-around is with Underwriters' Laboratories. They decided to insist that new color sets coming off production lines meet the tough rule of no more than 0.1 mR/hr of x-radiation. This tight limitation was to be expected (this column, September 1969), but not so soon. The government hasn't made public its own recommendations yet, and a lot of people - especially set makers - think UL is jumping the gun. Last we heard before press time, UL is thinking of relenting and allowing more time for compliance. That seems the logical thing to do, but the entire ploy seems strangely conceived and oddly timed. Mid-1970 is a more reasonable deadline, or at least after the Bureau of Radiological Health has had time to set standards and stipulate conditions of measurement. Sure enough, the cassette market is turning into a full-fledged boom. The equipment is selling like hotcakes and the big record companies are hurrying albums and hits into the new format. For example, at one swoop recently, RCA Victor introduced 40 new cassette titles and Columbia Records brought out 58. Perhaps surprisingly, many of the new releases are classical - which is usually reserved for really "high" fidelity stereo equipment (few cassette machines qualify). The cassette, before it started booming, looked as if it would be a low-cost medium, suited mostly to young people. With new stereo cassette releases selling at $6.95, $6.98, and $7.95, it isn't really what you'd call a kids' market. The cassette isn't moving into the auto field with any speed, either; 8-track still dominates there. But for portable music, the cassette is winning the race hands down. Cassette machines aren't all cheap, either - nor simple, as they were at first. As an example, H. H. Scott now has the Model 3610 Casseiver, It has a synchronous motor, twin vu meters for recording, sound-on-sound capability, and of course a receiver. The price: $399.95. Not many youngsters will get one of those for rock 'n' roll. The hi-fi gear that will dominate the 1969-70 season is the compact, followed by components. Yet a couple of companies that specialize in hi-fi have come out with big consoles. One well-remembered name is Capehart, known in years past for quality in "furniture" hi-fi. Electrophonic is also shooting for big-ticket sales with imported gear that's assembled in the U.S. (cabinets are from Yugoslavia). We still hear complaints from housewives about hi-fi. The usual one is: "Why can't component hi-fi be made more esthetically attractive?" Not nearly enough manufacturers are doing anything about it, and from conversations we hear among consumers, none has found a real answer yet. Sales trends suggest that digital clock radios may outsell regular kind within another year or two. Setchell Carlson, first manufacturer to use modular construction for home TV, quits that business upon being sold to Audiotronics Corp.; may continue CCTV... Beginning to appear around country are "Cartridge City" stores owned by Muntz Stereo-Pak; saw one in Nashville - very flashy ; half-dozen open so far.